Shenzhen, which is famous for its electronic products, located in the south of China. Shenzhen is the first and one of the most successful Special Economic Zones in China, and one of the busiest container ports in the world. There are about 300,000 foreign buyers sourcing goods in Shenzhen then shipping all over the world! 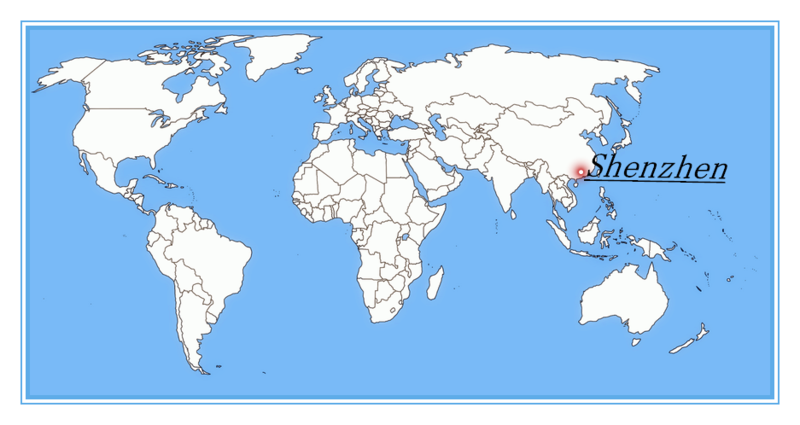 The following world map to indicate where Shenzhen is. For a better understanding of Shenzhen, please click this link: Why Shenzhen. Want to learn more about Shenzhen’s Weather, History and Culture ect. Please click this Link: Shenzhen City, Shenzhen Weather. Finding a hotel,restaurant or where the Church is, please click this Link: Shenzhen City life, Shenzhen Hotel. The complete graph of Shenzhen market, please click this Link: Shenzhen market. The Best way to Shenzhen such as Shanghai to Shenzhen, Guangzhou to Shenzhen and Hongkong to Shenzhen etc. Please click this Link: How Can I Go to Shenzhen from My Country?